Our Mobile Car Wash Water Recycling System will help reclaim water as well as enable you to reuse the water. Protecting the environment from wash water runoff and being compliant with EPA storm regulations is very simple, economical and effective with the Alkota Vacuum Filtration System (VFS). The VFS is designed to be used as a portable or stationary treatment system that guarantees results with ease of service, while minimizing costs. Our mobile car wash recycling system is automatic and easy to use. 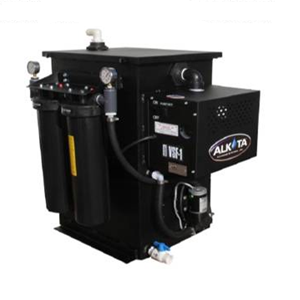 This system comes with a zero or controlled discharge system that has been uniquely designed to keep mobile car wash and detailing businesses operating without expensive filter cost, down time and additional labor. The VFS can be equipped with a portable wheel kit for specific job sight portability or can easily fit into pick-up trucks, vans or onto trailers. The complete filtration process utilized in the VFS is the first of its kind and the manner in which it operates is unique and proprietary only to Alkota. The first two Phases of filtration operate and flow under a vacuum or negative void to enhance the flow and extended filter life. The wash water is vacuumed through the pre-filtered 14" round patent pending 4-mesh multi-tier suction head or a specifically designed surface cleaner. The waste stream then enters the Phase I filtration chamber that contains three 100 micron screen filters and eight polymer impregnated micro-fiber filters. This process removes most solids and 99.9% of free oil and petroleum type products. This consumes no time and saves on expensive bag filters or baskets that do not need to be cleaned. The VFS Phase II filtration continues with the patent pending Perking® Filtration process trapping any remaining fine solids with three 120 mesh screens that never need removed or replaced. Finally, the effluent enters the Phase III filtration which is pressurized through high density string wound polishing filters of 50 and 20 micron to a discharge source of choice. The polishing filters are monitored by pressure differential gauges, making it easy to identify when filters need cleaning or replacement. For mobile auto detailers and mobile car wash operators this is perfect to reclaim, filter, contain and use the water over. A water tank can also be attached if additional water needs to be reclaimed. The unit itself will hold 50 gallons of water. This unit will allow you to vacuum waste water up to 60 gallons. In addition, the 17 stage filtration system removes dirt and oil allowing you to re-use wash water.